Everything works better and lasts longer with simple maintenance – your new Purple Martin house is no exception. Assemble your new house – most require assembly with simple tools. Make sure the pole sits solid in its socket or in the ground. It is best to cement the ground socket or pole into place. Familiarize yourself with the workings of the pole; grease or oil the mechanisms if necessary. Keep entry holes plugged until the nesting season begins. For mature colonies, this will be when you see the first martins, or scouts. For new colonies, this will be 3 to 6 weeks later. Click Here to see when the martins will be returning to your area. Place your decoys and play your attractor CD’s and tapes. Once occupied, do regular inspections of the ground beneath the house – this is where you may first notice problems with predators. Do regular inspections of the nests – lower the house and keep notes on what you see. This will not cause parents to abandon their young! Join the Project Martin watch of the Purple Martin Conservation Association. If you are in an area subject to severe winter weather, it may be best to remove your housing from its pole. If you don’t take down the house, plug the entry holes to keep late season birds from entering. This is also a good time to clean things up so you are ready for next year. 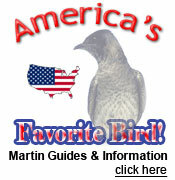 Click here to see our Coates Purple Martin House Cleaner.